This week, I arranged to meet with Charmaine Benjamin-Werth, a long established and much sought after interior designer in Antigua. “I’m an island girl”, she tells me. I can feel the vibe, from her beach chic home eclectically filled with strategically placed art collected over the years, patterned co-ordinated fabrics in the many seating areas and coloured tiles. What strikes me immediately is her beauty, then I find her warmth and sunshine. Like a cat that curls up elegantly on the sofa, so does Charmaine, a feline coil of grace and elegance, of polish and poise, I am won over within minutes! Originally from Grenada, but growing up in Antigua and educated further in America, she couldn’t stay away from her home in the islands for long and now lives by the sea with architectural designer husband Kerry. Her two grown up children study and live in America. She is highly sought after as a designer, the one and only profession she has ever wanted to do. It must be quite a responsibility designing a home that is not your own? She tells me how true that is for her, however that each project involves her really working in partnership with her clients, becoming their counsellor and advisor, an intensely personal adventure, as she interprets their ideas and uses her knowledge to create their vision. Instagram is where she tells me that she finds lots of inspiration and even meets other design mavens. I ask her who in particular she follows, Sheila Bridges, Kelly Wearstler, Kelly Hoppen are amongst them. Unsurprisingly, design influences every facet of her life and home, from her interest in fashion, food and of course, interiors, to her daughters pursuing careers in photography and writing. She likes boldness in colour and her style is very much a Caribbean meets California vibe. Scroll down for images of her own home as well as past projects! 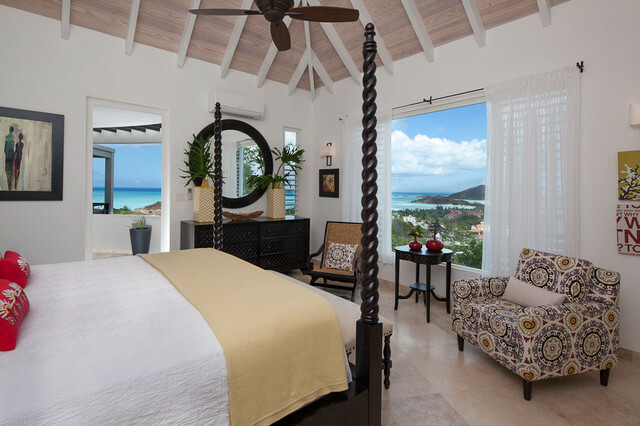 Char, welcome to Antigua Views! It is a true delight to have you here. 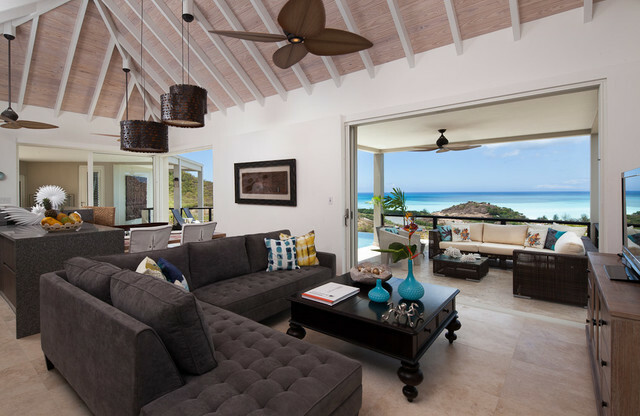 Please introduce yourself briefly – where you started out and the path that led you here to interior design in Antigua? Interior design always sounds like a dream job! Was interior design a career that you had always wanted or how were you motivated to pursue it? I’m Caribbean, born and bred … born in Grenada, lived in Guyana, raised in Antigua and university in the US. I remember when I was given my first Barbie doll! Not for dressing her up or giving her funky hairstyles or even playing make-believe, but because I was obsessed with designing cool interiors for her. And they had to be perfect, right down to the cups and saucers and the placing of sofas and chairs on my neighbour’s 24 x 24 verandah tiles, which I used as ‘rooms’. (The tiles at my home were only 12 x 12, and my Barbie and her friends needed more space for their growing collection of furniture.) So top of my Santa list every year was always ‘furniture for Barbie’, sad as that may sound. I soon progressed from Barbie interiors to my parents’ home – they lived in fear of my incessant rearrangements: one day the sofa would be safely against the wall; the next day they’d arrive home to find it floating in the middle of the room or outside in the garden, accompanied by the television and maybe a lamp or two. So I guess that even at that young age I recognized the potential, and the joy, of creating outdoor living spaces! I went off to University when I was 16, not quite sure of my major. I spent many weekends driving from Tampa to Miami to visit colleges there and seeing what majors the bigger city had to offer. I came across and ad for International Fine Arts College and applied. I was accepted, and the rest is really history. I returned to Antigua in 1997, with my husband, Kerry (an architect), and two young daughters, Kierstyn (currently studying early childhood education and children’s literature in Los Angeles) and Yensa (a professional photographer who has recently returned to Antigua from Santa Barbara). The islands have had a tremendous influence on me, personally and professionally. But, I draw on many different traditions for inspiration. I came across a word recently that stuck in my mind – métissage, which refers to a merging and blurring of cultures and identities. I think it pretty much sums up the spirit of what I’m interested in, of what I believe in, and also, I suppose, of whom I am. My friends are from wildly different places and backgrounds –artists, musicians, actors, photographers, writers, potters, sculptors, stylists; but also doctors, lawyers, fishermen, gardeners and farmers. I thrive in this atmosphere of diversity, and on the edginess it can bring. Sameness is a kind of death for me. Antigua gives me this melting pot of everything. You trained in the US at the Miami International University of Art & Design, then interned with Tessi Garcia. What a great way to start your career! You then moved on to Senior designer for Bed, Bath & Beyond and Ethan Allen in the US. What prompted the eventual move back to the Caribbean? My second winter in the North East! That did it for me. Your bio says that you have a ‘highly individualistic design style’, one of the reasons that you launched your own company. Can you describe this design style? I love art and light and the outdoors. 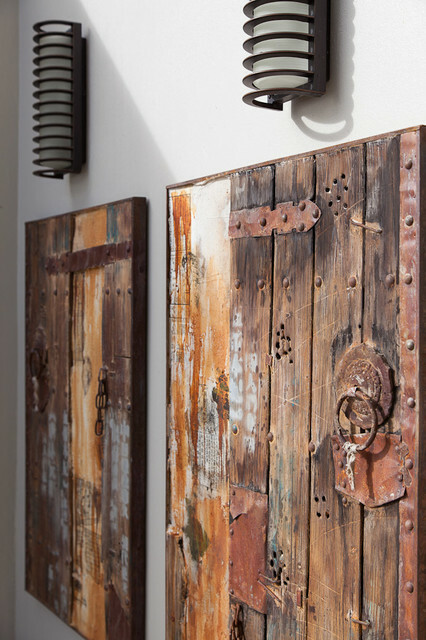 My approach offers an inspiring re-interpretation of Caribbean living. I try always to keep a firm focus on the clients’ needs and then develop strategies to deliver the services that meet those needs. It’s a simple formula that seems to have worked quite well so far! The company that you know co-own with your husband Kerry (architectural designer) , d-studio, was launched in 2004. Was it a huge step to go out on your own after a career working for other companies? How did you launch the business and did it grow through advertising or word of mouth? It was quite a difficult decision. It is always quite comfortable having a monthly pay check. I have heard other designers refer to freelance work as feast or famine. I have to agree. Luckily, business has grown through word of mouth. What field of interior design do you now specialise in? You are not restricted to Antigua, where have you worked on other projects? I enjoy hospitality and residential. I do like to do retail as well. But, I like to focus on retail that is for the islands. Recently my projects have been local. I have consulted lately on projects in the US and a few other islands. Where do you source the elements that you put together in your projects? 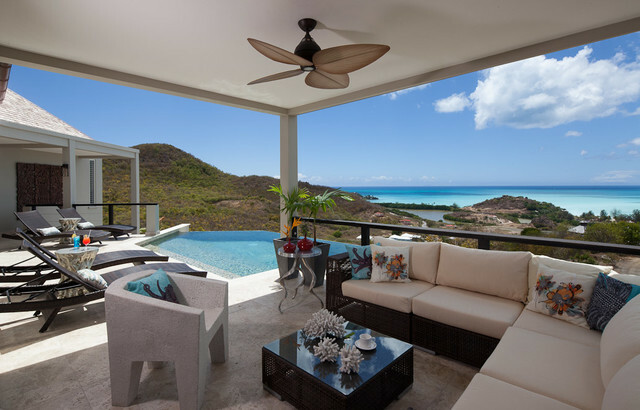 Antigua is a very small island in the Caribbean, do you have to travel a lot to pursue certain design elements? Who are your favourite artists / designers whose work you include in projects? I source most of the items from The US and Europe. I try to use local artists such as Guava, Maria Tyrell, Lyris Tracy and Yensa Werth to name a few. The pieces I specify tend to have a boho chic island feel. I love Malene B’s carpets and tiles, Justina Blakeney’s mirrors and furniture and use a lot of Jason Phillips from Phillips Collection pieces. I try to incorporate as many natural elements as I can find… driftwood, petrified wood, washed-up sea fans and coral. Is there a thought process that you go through when designing a venue? Can you describe how that creative and productive process works? Do you have a niche team that you work with on your projects? You are a modern Caribbean woman and Antigua is your home but you have also worked in many of the other islands and the US. What do you most love about it here in Antigua? I love the laid back vibe of Antigua and the fact that everyone is family. I have known people all my life here, I know their children, my children are friends with their children. There is a real sense of community here… with people who come from here and with people who now call Antigua their home. I love shopping for fruits and vegetables from roadside vendors, getting eggs and chicken from Hall’s Valley Farm. The colours of the roadside vendor stalls inspire me. If you could meet and work with anyone, what, where and for whom would your dream project be? Hmmm…. Tough one! I think my dream client would be my husband and me… I would love to design and renovate or build a very small boutique hotel incorporating a modern experience of the bygone Caribbean. I would love to create it physically, astatically and culturally. You have 2 artistic daughters based in the US, you must be very proud! How did you encourage them growing up? Were creativity and design a part of their daily lives? We let them be them! Design and Creativity were always a part of their lives at home and on our travels. First stop to big cities was a museum or gallery. So was the last stop, for that matter. Can you describe your own home, the colours, layout and design and your favourite piece of furniture and art? My house is my haven. It is very West Indian. It’s a simple, single-story beach house that looks out onto the piercing blue ocean and to a small offshore island called Prickly Pear in the distance. The colours that surround us are sensational and change dramatically throughout the course of the day, and according to the weather – from deep greens of the foliage, to vibrant blues of the sea and sky to touches of white from the surf and occasional cloud. We’ve allowed nature to speak for itself in our home – to maximize the beauty of the landscape by keeping things clean and simple and in tandem with the tropical landscape. There’s no fuss and frills. It’s all clean lines and understated elegance: found objects from the beach, shells, driftwood, petrified wood and art. Lots of art. Caribbean life is all about outside living and we’ve recreated this spirit in our home. We have several different outside ‘rooms’: a couple of secluded areas for quiet contemplation; another that is hidden away and embraced by tropical greenery; and then a couple of larger spaces for lounging, dining, entertaining, chilling and listening to music. The outside is an extension of the inside, which in turn is framed by the jaw dropping seascape. Everything in my home holds a special meaning for me and my husband and represents something important, whether a memory, an experience, an achievement, or a specific person, place or situation. I remember where we’ve purchased each piece as well as the emotion associated with that experience – the thrill and happiness. Finally, Antigua is a stunning island with breath-taking views around every corner. Where is your favourite spot to soak up the view? I love the view from Grace Bay Moravian church and the ruins of the church that came before the present one. It’s on Old Road looking down at Carlisle Bay. Thank you Charmaine for this really special interview!